For all its popularity, R-value offers very little in terms of assessing an insulation products ability to stop heat transfer and thereby save energy. Unfortunately, this metric has been so heavily used – and exploited – by fiberglass insulation manufacturers that it has become the standard by which all insulation products are judged. 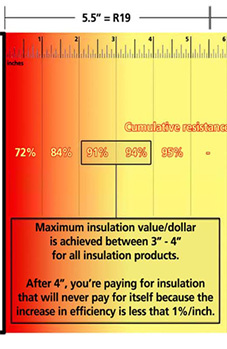 Why have these manufacturers promoted a bogus metric as the primary means of measuring insulation effectiveness? Well I’m glad you asked! It’s because the metric heavily favors fibrous insulation products because the test used to determine R-value exaggerates the performance of fibrous insulation. As with all products, it is difficult, and perhaps even impossible, to define over-all effectiveness with a single number. To truly assess insulation product’s ability to stop heat transfer, we must know several metrics including: R-value, vapor permeability, steady state time, emissivity, and etc. Don’t worry if you’re head is starting to hurt. We’ll boil it down to a simple formula very soon. So why do we allow the R-value fairy tale to perpetuate? I guess you’d have to ask fiberglass manufacturers with their full-time political lobbying efforts and their billion dollar businesses. Consider the R-value of an insulation after it has been submersed in water or as a 20 mile-per-hour wind blows through it. In either of these scenarios, the R-value of fiber insulations goes to zero. But you wouldn’t know this from looking at the label on the package. But wait . . . aren’t those conditions present in our world affecting our houses at one time or another? Doesn’t the R-value test take these scenarios into consideration? Nope. If it did, we’d discover that the R-value of fiberglass – when the wind is blowing or when it gets wet – is actually zero. The R-value test is performed in a vacuum with zero moisture and zero air present. So at best – it offers you an indication of how fiber insulation would perform if you were building a house in outer space. Valuable information to be sure. Incidentally, water, wind, and other conditions present in our atmosphere barely affect the performance of solid insulations like spray foam. This is why spray foam with an R-value of 6 will perform about 50% better than fiberglass or cellulose with an R-value of 13. Unfortunately consumers and code bodies have adopted the R-value propaganda and view R-value as the true measure of insulation’s effectiveness. Code bodies mandate R-values of 20s or 30s or 40s and consumers go to Home Depot and buy bags of insulation to add more R-value to their attics in an attempt to save energy. But fiber insulation with an R-value of 25 placed in an improperly sealed house will allow wind to blow through it as if there were no insulation. Again, R-value is accurate when the material is tested in the absence of air and moisture. But these conditions not even remotely resemble the conditions in the real world. Consequently, we must start asking for some additional dimensions to our insulation. We need to know its resistance to air penetration, to free water, and to vapor drive. We must begin demanding to know the R-value of an insulating material after it is subjected to real world conditions. As it is currently used, R-value is a number that is supposed to indicate a material’s ability to resist heat loss. It is derived by taking the k-value of a product and dividing it into the number one. The k-value is the actual measurement of heat transferred through a specific material. The test used to produce the k-value is an ASTM (American Society for Testing and Materials) test. This ASTM test was designed by a committee to give us measurement values that – they hoped – would be meaningful. Unfortunately, the test was designed with a flaw or bias. The test was designed with input primarily from the manufacturers of fiber insulation products like fiberglass, rock wool and cellulose fiber and the like. Very little input went into the test for solid insulations, such as foam glass, cork, expanded polystyrene or urethane foam because these products were adopted as building insulation products several years later. Thus, in order to enable their products to achieve high scores, the fiber insulation manufacturers lobbied heavily to have the test exclude air movement (wind) or any amount of moisture (water vapor). And therefore fiberglass is generally assigned an R-value of approximately 3.5 per inch. However, it will only achieve that R-value if tested in an absolute zero wind and zero moisture environments. Zero wind and zero moisture are not real-world. Our houses leak air, all our buildings leak air, and they often leak water. Water vapor from the atmosphere, showers, cooking, breathing, etc. constantly moves back and forth through the building envelope. If an attic is not properly insulated, water vapor from inside a house will very quickly semi-saturate the fiber insulation above the ceilings. Even small amounts of moisture will cause a dramatic drop in fiber insulation’s R-value — as much as 50% or more. I knew what he meant. He wanted to know how I could look folks in the eye and sell them a more expensive insulation instead of cheap fiberglass. I told him the way I did it was with a spray gun. Of course, that wasn’t the answer he wanted. He wanted to know why I did not feel guilty. I told him about insulating one of two nearly identical houses built side-by-side. We insulated the walls of one with 1.25 inches of urethane. Its near-twin was insulated with full, thick fiberglass batts by a reputable installer. Not only did we use just 1.25 inches of urethane as the total wall insulation, but we had the builder leave off the insulated sheathing. At the end of the first winter, the urethane insulated home had a heating bill half of its neighbor. Again, such evidence is not terribly scientific, but it is very real. I am not sure that the manager was convinced, but it should be noted: in the following year, that same company jumped into the urethane foam supply business. One and a quarter inch of polyurethane sprayed properly in the wall of a house will prevent more heat loss than all the fiber insulation that can be crammed in the walls — even up to an eight-inch thickness. Not only does the polyurethane provide better insulation, it provides the house with significant additional strength. Brent was an early client of mine for whom I had insulated several potato storages. He knew what spray-in-place urethane insulation could do. When he decided to build his new, very large, very fancy new home, he asked me to insulate it. The builder pitched a fit. He didn’t need any of that spray-in-place urethane in his buildings. He made his buildings tight, and fiberglass was just as good. Brent told the builder, “I know who is going to insulate the building. It is not as definite as to who is going to be the contractor. You can make up your mind. We are going to have the urethane insulation and you build the building, or we are going to have the urethane insulation, and I will have someone else build the building.” It didn’t take the contractor long to decide he wanted to use urethane insulation.